Listen to Rob and Feifei talking about money. As you listen, think about these questions? Why does Rob want to borrow money? Does FeiFei think the idea will be successful? How many companies is Rob planning to invest in? Rob, what are you doing? (counting out money) Oh hi, I'm just counting up all my money… actually, Feifei, could I borrow £100, please? £100? That's a lot of money. What do you need it for? Well, with all my savings plus your £100, I'll just have enough. To invest in this new company my friend is setting up. He's invented this machine where you can talk to people anywhere in the world and there are no wires or cables. It's going to be a huge success. Rob, that sounds to me like a mobile phone – that's already been invented. Yeah but you can also type messages on it and send them to other people. Absolutely amazing! If this is successful my investment is going to make me millions of pounds! Err, Rob calm down. Don't put all your eggs in one basket. What? I'm not investing in eggs – this is real money. And what do you mean about one basket? I wasn't going to put the money in a basket! It's a saying! 'Don't put all your eggs in one basket' – it's an expression that means you should never rely on just one plan because it could go wrong. Rob, don't use all of your savings on this one idea – it might fail. Fail? Do you really think so? 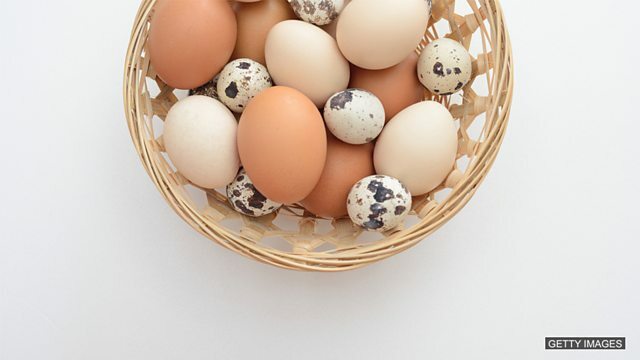 Are you really saying putting all my eggs – or my money - in one basket is too risky? My dad says I should buy shares in a lot of different companies, and not put all my eggs in one basket. He said my money would be safer that way. You shouldn’t just apply for one job. What happens if you don’t get it? Don’t put all your eggs in one basket. When he was younger, Michael didn’t put all his eggs in one basket, he invested in many business ideas. Now he’s a very rich and successful businessman. So, don't put all your eggs in one basket. Have you got the message, Rob? Yes. So, I mustn't depend on one idea to make me rich. I'm not so sure about my friend's new idea anyway, but does that mean you won't lend me £100? What about for my other cracking good idea - one that you really will need a basket for? I have bought a chicken. It means I won't have to buy eggs at the supermarket anymore. It will save me lots of money. Oh look, she's just laid her first egg… here, Feifei, catch. Can you put that in the basket for me? Watch out, that nearly hit me. ስለዚህም አሁን ሮብ ሁሉንም ዕንቁላሎቹን በአንድ ቅርጫት ውስጥ ላለማስቀመጥ ወሰነ። ‘ዕንቁላሎችዎን ሁሉ በአንድ ቅርጫት’ ውስጥ አስቀምጠው ያውቃሉ?ለተጨማሪ እንግሊዝኛ አገላለፅ ትምህርቶች English Expressions በሚቀጥለው ክፍል ይጠብቁን። See you next time! To invest in his friend’s company. Feifei doesn’t think the idea will be successful. አንድ ነገር ላይ ብቻ መተማመን ጥሩ ነው? ባይሳካስ? Which is the correct definition of ‘to put all your eggs in one basket’? የት በአንድ ነገር ላይ ብቻ መተማመን የለብንም? Which of these sentences uses the expression correctly? Which of these sentences uses the meaning of the expression correctly? Have you ever ‘put all your eggs in one basket’? What was the situation? What happened? Come and tell us on our Facebook group.